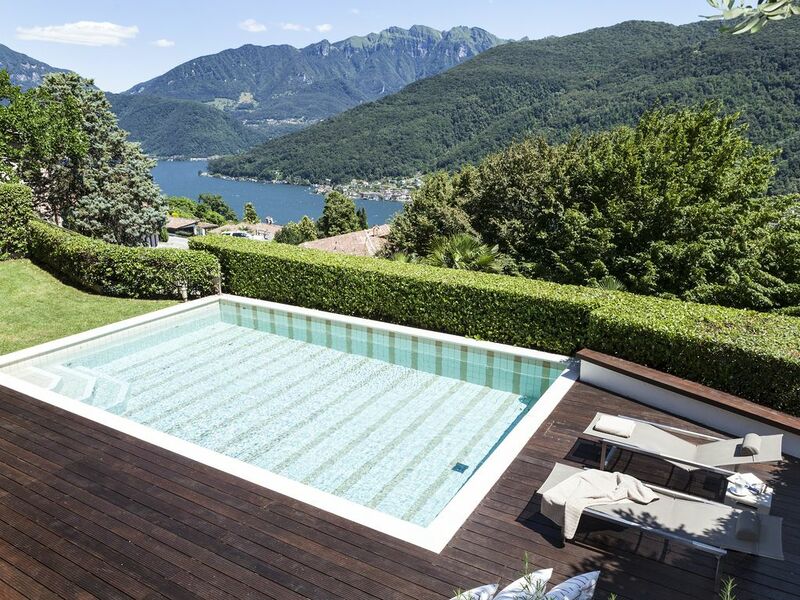 River House is a recently refurbished modern villa with fantastic lake views in beautiful, peaceful Vico Morcote, only 15 minutes to Lugano center with heated pool, portico dining area and beautiful garden with a small river and separate covered barbecue grotto. Villa is very accessible with an elevator to both floors from the double garage. The house is a luxury independent villa with all modern features. The house has recently been refurnished. It is very airy in summer but there is underfloor heating and a fireplace for the winter. The pool is heated from Easter until the end of September. The main living floor is upstairs and this has outside gates to prevent access to the pool and stream for children and pets. The master bedroom suite with bath tub, separate shower and twin basins plus walk-in dressing room is on this floor. Downstairs there are three bedrooms and TV room, all rooms except the children's room face the lake and have doors opening to the terrace/pool area. - Both floors can be directly accessed by the elevator which is large enough for a wheelchair. - huge open plan living area, with sitting room, dining area, library corner and fire place with walnut parquet flooring throughout. Equipped with Swisscom cable TV with video on demand, Netflix and Blu-ray DVD, Bose Bluetooth sound system. - small cellar with additional refrigerator and wine refrigerator. My husband and I bought, gutted , extended and remodelled this villa when we first got married. It was a labour of love and much effort has gone into the details to ensure that this is an extremely comfortable family home. It has always been the scene of large gatherings of family and friends who come from various parts of the globe. We lived there for 10 years until our careers took us first to Paris and then to London. This is an ideal place to get away from it all and relax by the pool. The house faces south and the pool area gets a lot of sun throughout the day. It is therapeutic to sit in the beautiful shaded gardens at the back of the house,listening to the sound of the stream that runs down the mountain and through the garden, Location is not overlooked- it is very quiet and there is no through traffic. Lugano is 15 minutes away by car. Closer by there is a supermarket, butcher, baker etc in Melide, which is also the nearest train station. There is much to do in the surrounding areas. There are good museums, restaurants, galleries and shopping in the town but also lots of nature and outdoor actives such as hiking and enjoying the lake which is in front of the villa. We are very close to Italy and have all the benefits such as climate and lifestyle coupled with the security and efficiency of living in Switzerland. Beautiful and comfortable villa with incredible views. We had one of the best family vacations ever at this wonderful villa in Vico Morcote. So much to do and see in this lovely region of Switzerland. We will definitely be back! It’s hard to name what was the best feature of this property ... the breathtaking view of Lake Lugano and Monte Generoso or the beautiful design of the vila which offers plenty of space, confort, privacy or the terraced garden with its mysterious scent or the refreshing pool... all to contribute to a perfect vacation. It has everything you need, even a child high chair we used for the youngest member of our family. I would definitely return to this wonderful place. Thanks for your kind review Viorel. It was a pleasure to host you and we hope to see you and your family again. By the way the mysterious scent is the jasmine that borders the lawn by the pool!